Cartilage piercings are becoming quite popular these days mainly because they offer a unique yet attractive look. The area outside the rim of your ear is cartilage, which is usually easy to pierce. This is the main reason why you can find people sporting multiple piercings within the cartilage. 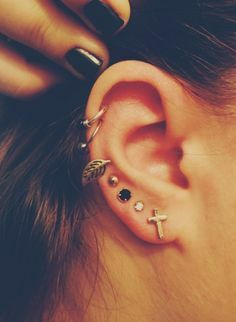 While it is true that these piercings look great, it is also a fact that cartilage piercing healing will take time. Besides, if you do not pay attention to certain factors, you may end up developing infections in those areas. Keep reading to find out how to prevent infections and speed up the cartilage piercing healing process. This healing process is made up of two stages. The first stage is the initial healing phase and the second one is the full healing phase. During the first healing phase, skin tube develops in the piercings. In the next stage, the skin or fistula will develop completely. It is important to take care of your piercing during the initial healing stage. Here are steps to take to prevent scarring and infection from developing. Make sure not to touch it! There are bacteria on your hands and you can infect your piercing easily by touching it with your hands. Avoid wearing make-up or body sprays while your piercing is still healing. Never twist the jewelry you are wearing at the first few weeks or it may tear the fistula. This will lead to scarring and slow down the cartilage piecing healing process. It is a good idea to douse the area with a sterile saline solution to keep it clean. You have to clean the pierced area thrice a day, but no more. Avoid jewelry with small gauges because they are more likely to be rejected. Never use methylated spirits, alcohol, hydrogen peroxide or betadine for cleaning and contact your healthcare provider immediately if an infection occurs. Here are more tips on how to better heal your cartilage piercing. Watch and learn! Complete cartilage piercing healing may take up to 12 months, so it is important to take proper care of the pierced area. If you have developed a cartilage-piercing bump, use the following ways to treat it. Using a salt soak is probably the safest way to deal with cartilage bumps. Take a cup of boiling water and add ¼ teaspoon of salt to it. Stir it well to ensure the salt has dissolved completely. Leave it for a while until it cools off a bit. Take a clean cotton pad and dip it into the cup. Apply it directly on your bump and hold it in place for a couple of minutes. Repeat twice a day until the bump is no longer visible. Adding chamomile tea to the salt soak will trigger healing and calm the skin around your piercing. Simply add a chamomile teabag to the boiling water that contains ¼ teaspoon of salt. Take a cotton bud and repeat the same application method as explained above. You can make use of a breathable tape to treat cartilage bumps through compression therapy. Use it only on your fully healed piercings to ensure it does not hamper the healing process. Simply cut a small strip of a breathable medical tape and cover your cartilage bump with it completely. Place it tightly enough to feel compression on the bump. Keep wearing it and replace it when it becomes dirty. Stick to the same method for a month or so to treat your bumps. Apply a couple drops of tea tree oil onto a cotton swab and place it directly on your cartilage bump. Doing this twice a day will show positive results. Be sure to dilute the oil if you have sensitive skin. Aspirin can open up the blood vessels under your cartilage bump and triggers cartilage piercing healing process. Simply crush an aspirin tablet in a bowl and add a few drops of water to it. Mix well to form a paste and apply it on your piercing bump. Leave for 10 minutes and rinse off with warm water. Repeat thrice a day for best results. Lemon juice has antibacterial properties and promotes healing of your piercing. Take half a lemon and squeeze its juice. Add some water to dilute the juice. Now, dip a Q-tip in the solution and apply directly on your bump. Repeat thrice a day to get rid of your bump. Honey may prove beneficial due to its natural healing properties. Simply applying a dab of honey directly on to your bump thrice a day will produce positive results. Take antibiotics. Discuss your symptoms with your doctor and he or she will prescribe antibiotics to clear your infection. Clean your pierced area with saline solution. It proves most effective for mild infections. Use warm compresses to improve blood flow to your cartilage and clear infections. Make a compress mixing water and sea salt together. Stick to a balanced diet and quit smoking to trigger cartilage piecing healing process. You should go to see your doctor immediately if you notice any sudden change in your cartilage piercing. It is often easy to treat an infection when it has just started.